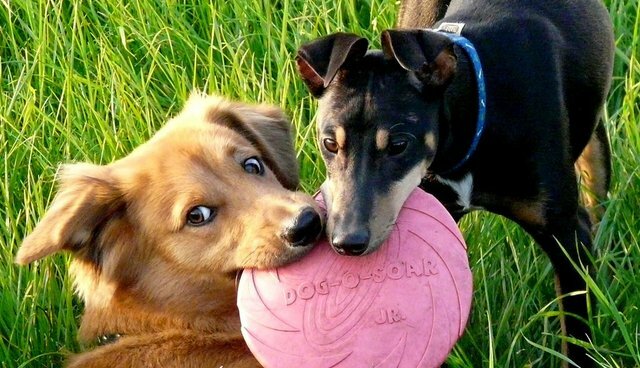 It's a no-brainer - dogs and many other nonhuman animals love to play with their buddies in all sorts of ways, and they have fun doing it. In a recent essay called " Playful fun in dogs" published in Current Biology in an issue devoted to the biology of fun (where you can see the fascinating table of contents; see also), I cover much of what we know about social play in dogs, and other essays discuss fun in other mammals and also birds, fish, reptiles, and invertebrates. The online essays are free, and I highly recommend reading them to learn what we know about the emotional lives of many other animals and why having fun has evolved in many diverse species. The "F" word: What is fun? Fun is one of the two "F" words that have received growing attention by ethologists, the other being "friends." (Some researchers ask, for example, "Do animals make friends?" Hint: of course they do). Ample data show that many diverse animals both have fun and make friends. Like play, fun is hard to define, but you know when you're having it and when you're not. Having fun means doing something that is amusing, enjoyable, and pleasurable and feeling good about it. It is an evolved adaptation and important for keeping an action or activity in an individual's behavioral repertoire. In my studies, I take a strongly evolutionary and ecological approach using Niko Tinbergen's integrative ideas about the questions with which ethological studies should be concerned: namely, evolution, adaptation, causation, and ontogeny (the development and emergence of individual differences). University of Tennessee psychologist Gordon Burghardt, author of "The Genesis Of Play," later suggested adding "subjective experience" to Tinbergen's scheme. Dr. Burghardt also has a very interesting essay in this issue of Current Biology called "Play in fishes, frogs and reptiles." So, concerning play and fun, we can ask: why did they evolve? How do they promote survival value and reproductive fitness and allow individuals to come to terms with the social situation in which they find themselves? What causes play and fun? How do play and fun develop? What is the emotional side of play and fun, or what is the personal experience of animals while they are playing? Play is serious business, but it is also fun. Animals seek it out. It is a voluntary activity, and play is highly contagious. Playing dogs are magnets for others, and I am always amazed at how fast dogs invite strangers into a playgroup and how they are absorbed into the fun. I think it's clear that dogs know when others are having fun and when they're not. And, as an aside, studying play is a lot of fun in and of itself. Research should be fun, and I'm sure I've continued to study play for more than four decades because it is fun to do. I hope you enjoy these essays as much as I did. It's a real sign of progress that an entire issue of a journal is devoted to the biology of fun. I was thrilled, and frankly surprised, when I was asked to contribute an essay, because I think that even five or 10 years ago such an undertaking would not have occurred. As I wrote above, the online essays are free and I highly recommend reading them to learn what we know about the emotional lives of many other animals - really a very diverse lot - and why having fun has evolved. It's a no-brainer, many animals simply love to have fun.